Daniel Maurer Scene of Monday’s shooting. Tonight is the last meeting of the Ninth Precinct Community Council this summer, and one subject is sure to come up: the recent uptick in crime in the East Village. According to the latest crime statistics compiled by the Police Department, felony assaults have increased by 33 percent in the last 28 days in comparison with the same period last year. Robberies are up 29 percent when comparing the same time frames. In the year to date, overall crime is up by roughly 3 percent when compared to 2011, according to statistics. 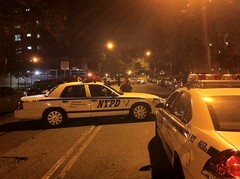 Melvin Felix The crime scene at Union Square East. 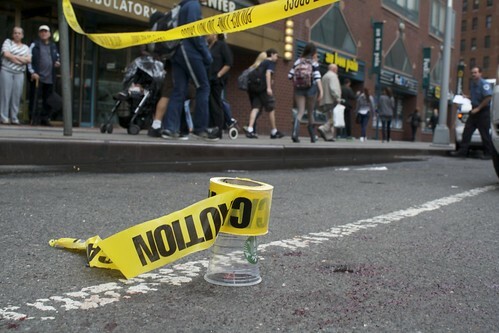 A man was slashed with a razor blade in Union Square this afternoon by an attacker who fled the scene, the police and witnesses said. The police said that around 2:30 p.m., across from Beth Israel’s Phillips Ambulatory Care Center at Union Square East near 15th Street, a 37-year-old man was slashed in the face by a man who wore a white t-shirt and is said to be around five-foot-eight and 170 pounds. 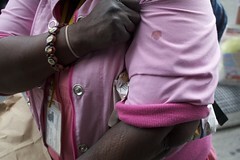 Melvin Felix Robin Stewart was spotted by the victim’s blood. Robin Stewart said she saw the alleged attacker approach her acquaintance, whom she named only as Mr. P, from behind and then use a razor blade to stab him in his head and neck. The slashing, she said, was in retaliation for an altercation between the two men yesterday in the same area. Here’s The Local’s latest installment of “Police And Thieves,” your weekly roundup of crime. What follows are the latest reports from Feb. 20 to Feb. 27, sorted by the type of incident. Our map of all of crime since Jan. 15 is at bottom. As previously reported, a pair of thieves robbed a woman at gunpoint on Feb. 22. Two witnesses collared a purse-snatcher after a chase into the subway on Feb. 24. The 25-year-old victim told the police she was at First Avenue and East 10th Street at around 12:15 a.m. when the suspect ran up from behind and tried to grab her purse. When the victim resisted the thief pushed her, ripped the purse from her hand and took off towards the First Avenue L train. As two witnesses gave chase the suspect tossed the purse. The pair then detained the suspect in the subway station until the police arrived. The police said that the suspect had seven prior arrests, including two robberies. This guy isn’t much of a pal. A 19-year-old told the police she was chatting with her “friend” in the 10th floor stairwell of the Jacob Riis Houses at around 1 a.m. when he grabbed her bag that she had set down on the floor. The victim gave chase, and on the seventh floor the suspect dropped what appeared to be the receiver of a 9-millimeter Smith and Wesson. A man’s wallet was stolen from Phoenix on Feb. 18. The 22-year-old victim told the police he set his coat down on the floor of the bar on East 13th Street at around 1 a.m. By 9:30 a.m. the next day the thief had made a whopping $8,000 in charges on his account.